I heard the 56th edition of the “Rhine Derby” was worth a watch. 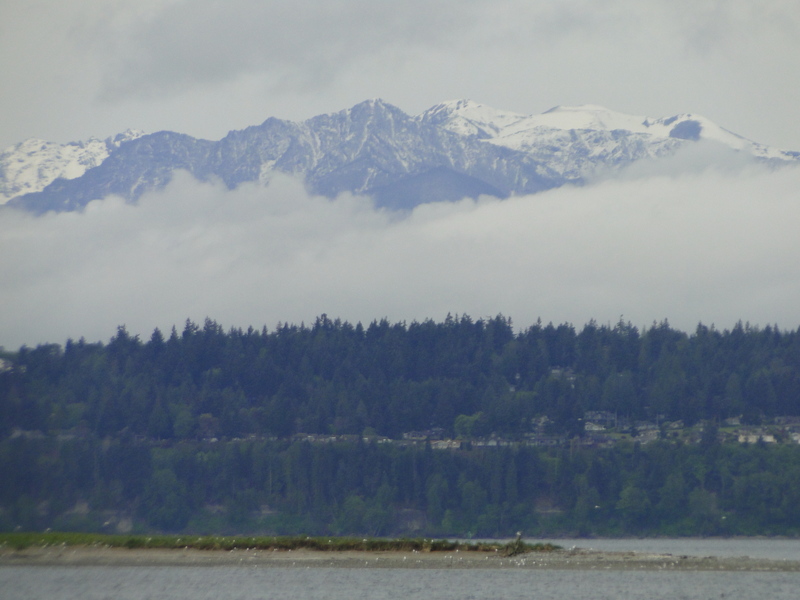 I heard it all the way out at Fort Flagler, Washington, where I was camping with my family over the weekend. Not a football match, but not a bad view for weekend mornings, either. Without the possibility of watching the match live, I didn’t make my normal match day effort to awaken early. Predictably, my two-year-old did not share my idea of the situation setting up nicely for a sleep-in and made sure we were all awake to enjoy the brisk morning air. I didn’t wait too long to check the Kicker app, which told me we trailed 0:1 in the 68th minute. “Not bad” was my thought as I went about the typical business of getting a camping morning started. By the time we got everyone dressed and were moving toward coffee and breakfast, I saw I had received this Twitter mention from a friend. Eric is, as you might notice, a Leverkusen fan. His message had me quickly returning to Kicker, where I learned of the late-match surge by the mighty EffZeh and Bård Finne’s equalizer. A quick exchange with Eric told me I would need to see the match in full. Reading #EffZeh Twitter and other social-media response to the match strongly reinforced the sense. So, if you are thus inclined, come along with me and relive all the fun of Saturday while I re-live blog as I watch the match for the first time. What else were you going to do? Watch DFB Pokal semifinals? Ha! 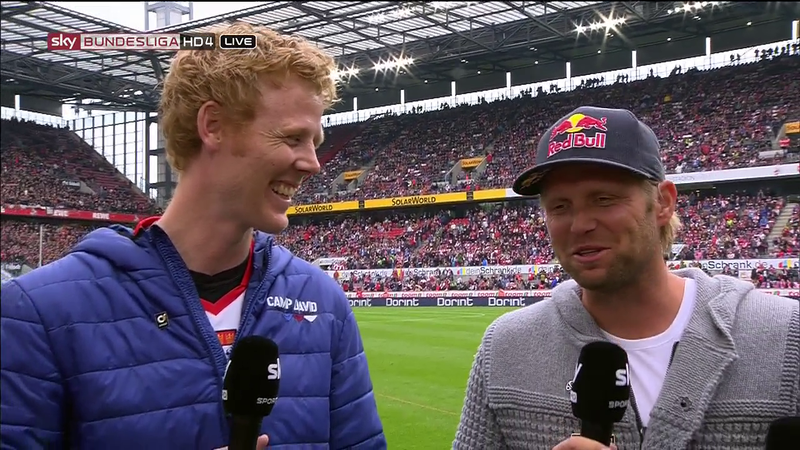 The Sky broadcast of the match started with a discussion with Jonas Reckermann and Julius Brink, Germany’s gold medal-winning Olympic beach volleyball duo. Why, other than their being celebrities? 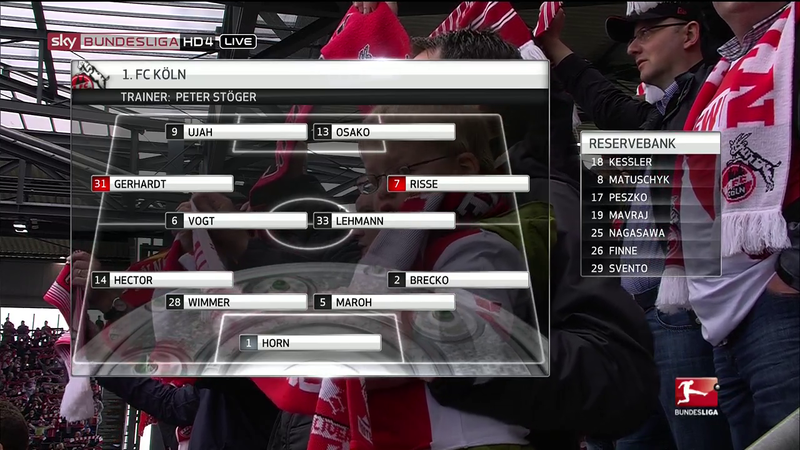 Reckermann is an EffZeh fan. Brink a Leverkusen fan. Reckermann in Karneval Trikot. Brink in Red Bull bro-cap. And, with that, Reckermann wins the pre-match interview. You know immediately Brink was wishing he’d said something a bit more encompassing, while proceding to admit an admiration for the atmosphere at Müngersdorfer. He even goes so far as to say that he has, through residing in the city, has started to feel he’s becoming a Kölner, though feels obligated to stick to his “old love” of Leverkusen. You have to respect that . . . I think. When asked for predictions, Reckermann said “1:1.” Brink figured his side would win 3:1. Again, score one for Reckermann. Considering the rather explosive results of the Ujah-Osako tandem in the last home match, there’s no surprise seeing them together again up top. Similarly, with the defense having been the driving force of this club maintaining a safe distance from relegation, we are well used to expecting and getting the same look from the defensive midfield and the back four (with captain Miso Brecko in for injured Pawel Olkowski, in case you’ve missed that), not to mention the very studly Timo Horn in goal. Former Leverkusener and life-long EffZeh fan Marcel Risse recovered from a slight knock that kept him out of the Hertha BSC match to make his first appearance against the club in which he was raised for the club to which he’s always been partial. Opposite Risse, though, went Yannick Gerhardt for his first start since returning from a long absence in which he battled mononucleosis. Though he got about half an hour in Berlin last week, a starting role for him might have been considered unexpected, particularly on the left flank, where he’s spent very little time since joining the professional ranks. Then you have the bench. Those seven sit and watch until they’re told to do otherwise. Seeing Kazuki Nagasawa returned to a reserve role is somewhat a disappointment, considering his tendency to be delightful. Otherwise, it’s a lot of familiar faces in their usual match day roles. As for Bayer Leverkusen . . . it’s eighteen dudes with names you may or may not know or care about, eleven of whom will start and play in some formation or other. You want to read about them, go read a Bayer Leverkusen blog. 1: From the very start, Gerhardt is at full-throttle. Just as the ball gets rolling, he charges after it. When the pass goes to Hakan Canhaloglu, he sprints to close the distance on the ball again to deliver and win a challenge for possession. Speed and engagement are two things to always love about Gerhardt. 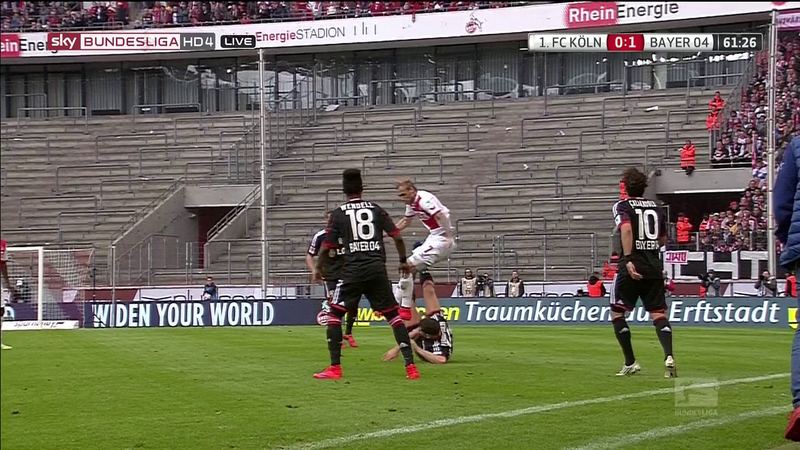 Kevin Vogt and Stefan Kießling then get tangled in a challenge for a ball in the air and tumble to the turf. Vogt turns to get up, and Kießling reacts as if suddenly struck in a painful manner. Now, we all know how much footballers like to fake harm being done to them in the hopes of winning prizes from the officials, but it did look as if Vogt’s leg might have inadvertently hit Kieß in the family pills. And because I have a theory that Kießling has been somewhat cursed since taking ownership of the famed phantom goal last season, I don’t think he’s faking this one. 5: First credible threat cleared at the last moment by Ömer Toprak. Risse made a nice move to get clear of Wendell near the center line, avoid the tackle of the since-beaten Wendell, and send a ball to Anthony Ujah. Despite a history of sometimes failing to see teammates in more-advantageous positions, Ujah does not miss Yuya Osako running into the space left available by the absences of Wendell and Kyriakos Papadopoulos. Looked good for a chance on goal, but Toprak made a play. 7: Heung-Min Son falls down trying to play Wendell through along the left side, resulting in a turnover as the ball went almost directly to Risse. Risse tries to reach Ujah en route to the other end of the field, but Toprak is again on the scene. This time, though, instead of a well-timed sliding tackle, Toprak shoves Ujah from behind while also planting his thigh into the back of Ujah’s thigh. Referee Deniz Aytekin sees nothing and allows play to continue, with Bayer absconding with the ball . . . unjustifiably. 13: Osako is whistled for foul on Toprak in the Bayer penalty area. The play was definitely a foul, but featured far less contact than what Toprak delivered on Ujah just six minutes prior. 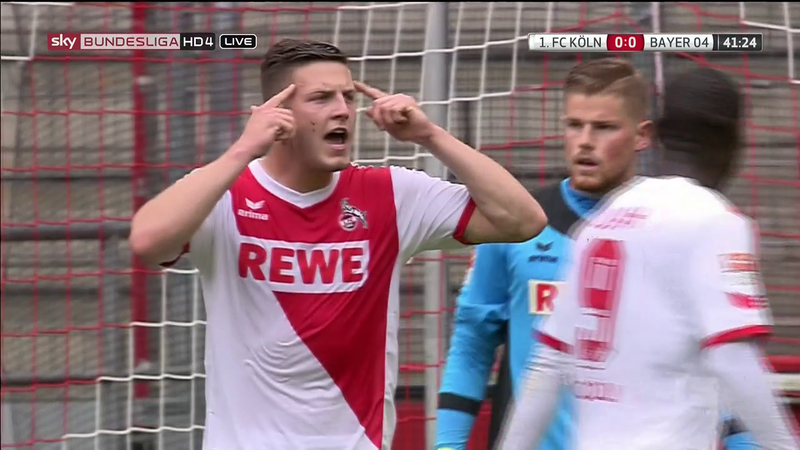 16: A bad pass by Rolfes turns into the best EffZeh chance so far. Rolfes’ errant pass finds Brecko, who was fortunately somewhat too deep after getting burned by Wendell near Leverkusen’s goal line. Brecko hits Risse headed down the right side. Risse’s low cross is out of reach of Ujah, but also eludes Leno. Roberto Hilbert is there to clear, much to the disappointment of Osako and Gerhardt, either of whom might otherwise have had a huge chance fall to them. 17: At the risk of this seeming like an unabashed Yannick Gerhardt lovefest . . .
With the ball again on the right side of the area, YG31 makes himself known as ‘available’ to Brecko. When Brecko’s pass is too heavy and taken away by Rolfes, Gerhardt presses the Leverkusen captain toward his own goal line. Rolfes is forced to send a clearance upfield and out of touch. Brecko, seemingly inspired by Gerhardt’s vigor, decides he too can put Rolfes under pressure and beats his counterpart to a ball in that same region, drawing a foul just outside the edge of the area which also gets Rolfes the first yellow card of the match. Now, if only we had someone capable of converting free kicks . . .
Blazing-fast Brecko bolts by Bolfes . . . balmost . . .
21: Hilbert apparently wishes no part of a Gerhardt lovefest and throws an elbow at our young protagonist. 24: Son is given a yellow for diving. Fair enough. 25: I’ve seen Jonas Hector’s serious, at-work face. I’ve seen his smirk-smile. I don’t know I’ve ever seen a full-blown grin from him, though. 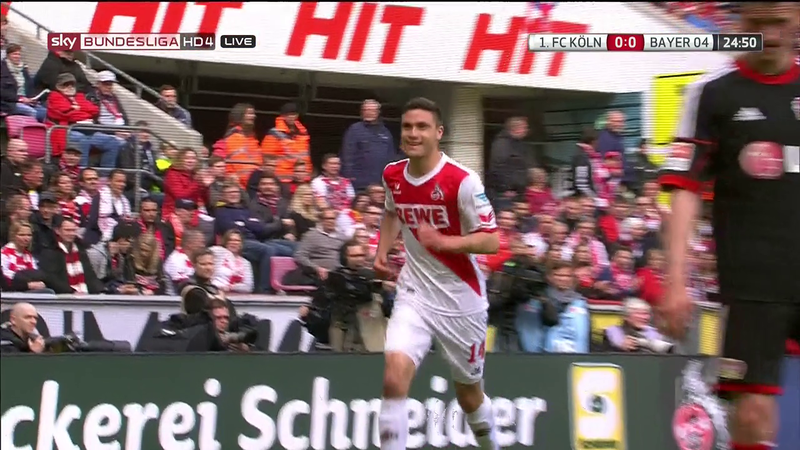 Is it just me, or is Jonas Hector having too much fun? 29: Kevin Vogt has enough space to scan the field and find something he likes. Do you see what Vogt sees? It’s one thing to see it, but another to get it there, yeah? Oh . . . well played! Osako chests Vogt’s fine ball to the grass just as Wendell slips and falls, leaving a less-obstructed path to Leno. Osako uncorks a shot which slams off Leno for a corner. 37: After eluding a tackle, Hector makes a run into too much open space in Leverkusen’s end that reminded momentarily of his wonder run and goal against Hoffenheim a few weeks ago. Instead of the insane finish, though, Hector plays off to Risse who uses the generous among of space to take a few steps and, at the behest of the entire stadium, launch a shot that sails harmlessly over the Leverkusen goal. That might have been fun. 40: The infamous awarding of a penalty has arrived. There is no good single frame that shows just how little there was in the play between Kießling and Maroh for there to be a penalty awarded. There was some contact between hips, but nothing egregious and certainly not what sent Kießling sprawling through the air as if he’d been shot in the back with a cannon. When it’s slowed down, though, you can see there is a slight adjustment in Kießling’s movement between the moment of contact and the moment he decides to go to the ground. It just looks like an awful call, overall. I’m sure worse have been given, but considering the one that was not given Leno in the Hinspiel, this borders on criminal negligence. Wimmer . . . I’m going to miss that guy. As Canhaloglu awaits his turn from the spot, Wimmer does a drive-by to deliver a bit of a pat/slap on the head. certainly wishing him no more luck than what is needed to not hurt himself in taking the shot. Whatever the reason, Canhaloglu’s penalty shot was far from precise. With Horn having chosen the right direction, it had no chance of making it in. Wimmer sweeps onto the scene to clear the ball away for a corner, congratulates Horn on the stop, and sends a message to his teammates. Then, is this “Play smart, guys!” or “I’m IN their heads now!”? Despite the scene, justice done. We won’t get into Horn coming off his line before the shot was struck because that is far too commonplace for argument. Sometimes you win the ball. Sometimes you tear a man down. In a more-just world, this tackle would have gone to Hilbert, who already threw a dirty elbow at Gerhardt and then levelled him in a brash collision, but maybe Gerhardt told Toprak to give Hilbert his regards. Gerhardt got a yellow, which did nothing to stop Schmidt from continuing his complaining to the fourth official any more than does the fact Schmidt watches Toprak deliver borderline tackles on a regular basis. I think I heard the commentator say it was the 12th time the EffZeh have had a scoreless match at halftime. I’m almost surprised it isn’t more than that. 51: The first interesting moment of the second half arrives after Risse appears ready to make a run down the right flank, but loses the ball to a challenge from Wendell. The ball deflects, though, to Vogt, who sends the ball through to Risse, who had read the play and moved forward despite having lost the ball. Wendell was slow to recover from getting off-balance in his challenge and seemed even slower in wanting to make the needed sprint to join in the defense. He is ostensibly a defender. Risse runs into Wendell’s unoccupied territory and sends a bit of a strange, rainbow-arcing cross toward the far post. Leno has to retreat a bit to get under it and then is only able to leap just enough to get one hand on the ball to deflect it away from Gerhardt and Osako who were ready to strike. Note Gerhardt’s position at the post and the time on the clock. The danger averted, Bayer looks to answer, as is typical. But what happens is yet another moment to feast on the glory that is young Yannick Gerhardt’s game. As I captioned above, look where he (with hands on his head) is and the time of the match while he’s there. Now, keep in mind that he followed the path of the ball, rather than a straight line to where he couldn’t have known it would go. In twelve seconds, Gerhardt loops around the penalty area in pursuit of the ball and ends up on the opposite touchline approaching the center line in pursuit of Son, who wears a face of terror on his face at being chased by a supernatural being. Son hates this, while Gerhardt simply doesn’t know what else he should do with his afternoon. It’s not fair. and just like that, we’re going back the other way. Yes, Becko did come flying in from out of frame with an assist, but not before Gerhardt nudged the ball into Son’s feet to disrupt the run. Pictures and my scribble hardly do justice. Hopefully you’ve seen it and already marvelled at it and are sick of me going on about how great Gerhardt played. 54: While the game pauses for the insertion of Julian Brandt for the woefully ineffective and potentially haunted Son, replay of the prior action shows that Risse’s cross was lightly deflected by Papadopoulos, which explains the strange arc. Gerhardt did get a foot on it after Leno’s deflection, but it was not at all controlled. 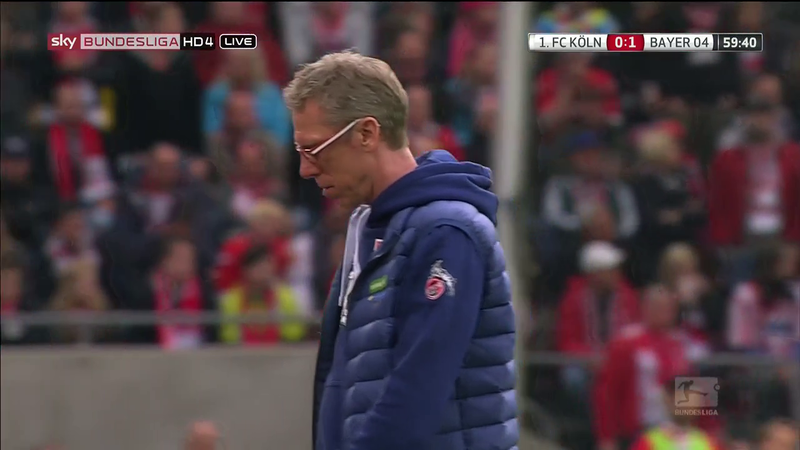 57: Bellarabi loses ball to Lehmann challenge deep in Leverkusen territory. Risse collects ball and sends through for Ujah. Ujah finds Lehmann with the cross, but Matze can only spike his shot off Hilbert’s chest? face? On either side of Hilbert would have been fine, Matze. Gerhardt’s attempt on the bounding deflection . . . not graceful. 58: The ball went the other direction for but a moment before the EffZeh came right back into the attack. Vogt got on a bit of a run before slotting a pass through for Risse. Again, Vogt has the vision and space. It looked so incredibly plausible that the 1:0 was coming . . . The shot threatened not Leno, nor his post, nor the side netting, nor anyone in the fan blocks behind the goal, I am sad to report. Though, we already knew that goal wasn’t going to be scored, eh? That’s the thing with watching a match with the result already known. Na ja . 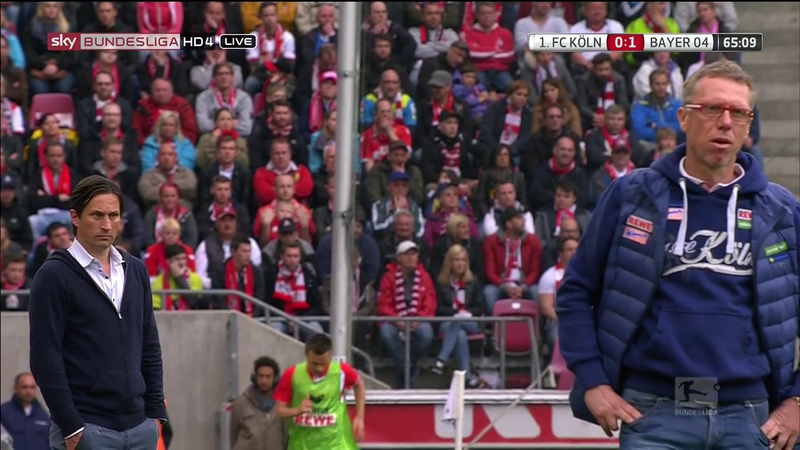 . .
60: Josip Drmic enters for Rolfes. Play resumes. Brandt scores. I hurt. Even though I knew it was coming, it hurts. It never seems reasonable to surrender a goal that quickly upon a resumption of play. Drmic, Bellarabi, and Brandt ran a good distance in tandem to arrange for a quick succession of passes ending with Brandt’s goal. Coach, there’s good news coming; I promise. 62: Moments after the restart, Papadopoulos goes for a bicycle-kick clearance near the touch line. He comes down fairly hard on his shoulder. Risse, who’d been pursuing the ball, turns away so as to not run into the kick and is tripped. As he comes down, his heel also strikes Papadopoulos on the back of the shoulder blade. Shoulder joints aren’t really meant to absorb that sort of impact . . . but I’m no doctor. One way or another, he’s hurt pretty badly. At least he appears to be screaming in pain. It’d be a surprise if Schmidt wasn’t forced to use his final substitution. Dude looks miserable (player, not coach). 63: He goes off. He comes back on. He nearly engages in a play. He goes back down. He’s done. Credit for giving it a try, hoss. Get well. Tin Jedvai enters the match. 66: I admit that I don’t watch too many Leverkusen matches, so maybe it’s been a fluke that I’ve never seen their coach wearing anything but all black. The above photo also makes me thing Stöger needs a giant Bundesliga logo belt buckle . . . maybe a cowboy hat, too. 67: Lehmann is fouled near the penalty arc. And I do mean that he was fouled, rather than his having been involved in one of those phantom incidents that take down the likes of a Son or a Kießling. Matze is a man and does not go down lightly. Besides, with our history of free kicks, there’s not a lot to be gained from winning fouls in otherwise-advantageous spots, is there? That said, Risse delivered a pretty good one. Leno hardly budged from his spot and was glad to see the ball whizz past the other side of his goal post. A near miss is still a miss, though. Before the ball is again put into play, Slawomir Peszko comes on for Gerhardt. One last time: great game YG31. 69: It seems only fair to note that Brecko was bailed out by a pretty poor call when he was beaten in a battle that should have left Bellarabi one-on-one with Horn. Not that Bellarabi is man enough to deal with Horn, necessarily, but it would have gotten interesting in a bad way in a hurry. Thanks, Aytekin? 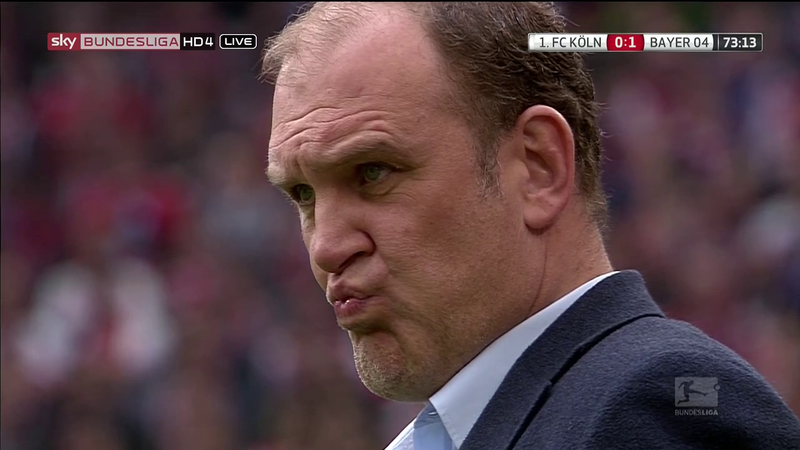 74: Every match, I assume, there comes a point where Jörg Schmadtke suffers thoughts that force his face to do this. Like I told coach earlier, good things are coming, Schmaddi! In this case, Schmadtke might be reacting to the run of play that ended with Kießling heading a ball just wide of the post, though it could also be to the aftermath thereof, which saw Horn and Maroh both collide with Kießling during the play, leaving his star keeper on the turf a few extra moments. 75: EffZeh quickly wins a corner. Corners remain among the set pieces with which we struggle, but this effort nearly paid off. Ujah was let alone to do his thing, for some reason, but his header went wide. 77: The team is pressing to level, without question. To aid the effort strategically, Stöger sends Finne on for Brecko. Striker for right back says it all. 78: Things continue to get increasingly more frantic, which is always fun to watch. Peszko used great effort to move the ball up the left flank before sending it to Ujah, who cut across the pitch with it toward the opposite side before just passing it to Osako. Osako spun Wendell in a circle, forcing the youngster to get a bit handsy in defending, which drew a whistle. Osako notes that Wendell has disengaged from competition from a moment, whether he’s frustrated at the call or simply with himself, and quickly stands up for a quick restart. You can see Bender trying to point Risse out to his young teammate, but it wouldn’t matter at that point anyhow, as he’s in no position to close that space. Risse has a clear view of last man Toprak and knows where to stand to be onside so he can take the pass legally and make the cross, which unfortunately finds Toprak’s boot. 82: Nagasawa on for Lehmann . . . who has the armband? 83: The second goal of the match did not come quite as quickly after the resumption of play following the substitution, but it wasn’t much slower to arrive. 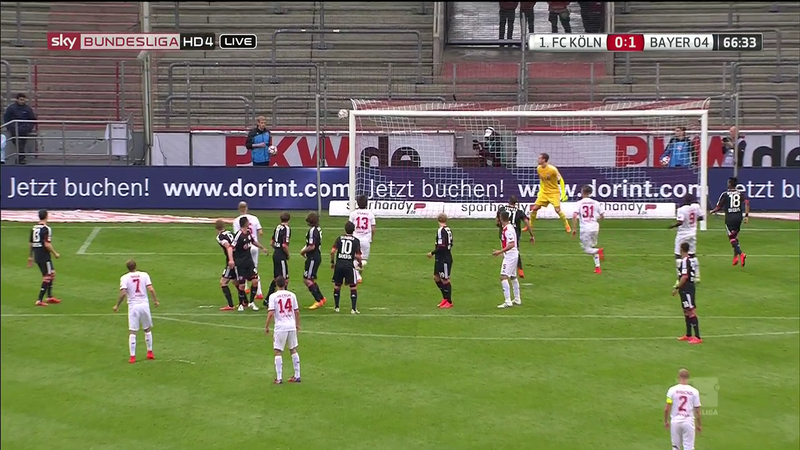 It started with a throw-in and initially went back toward Köln’s end. Maroh had the ball near the center line and passed to Risse who had space but was playing more defensively due to post-substitution rearrangements of job duties. Risse’s ball finds the area where it’ll be up to Ujah and Toprak to decide what happens next, and Ujah comes out the better man. As if there were any question as to who is the better man in that equation . . .
Ujah sends the ball toward Finne. 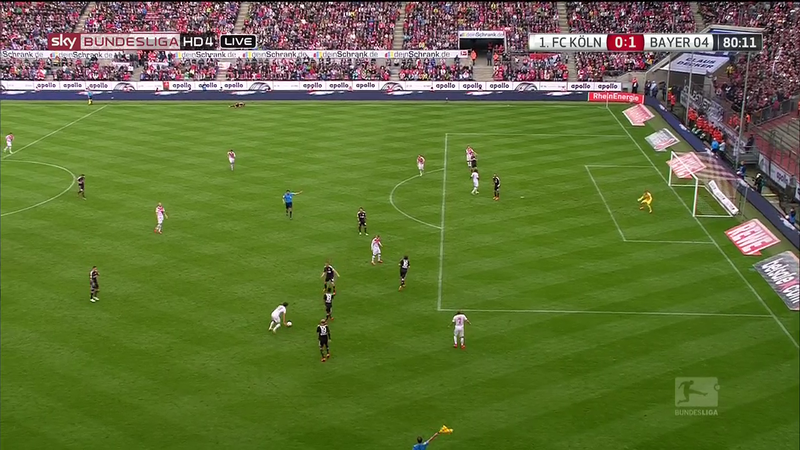 Jedvaj attempts to reverse direction to stay in the play but falls, leaving Finne all alone to shoot on Leno’s goal. Grab your EffZeh glory, son! Finne did not miss converting his first Bundesliga goal. He’s certain to remember it forever, but he also timed it so that it will also be remembered by Planet EffZeh. 85: Once you’ve shown that your long-touch is on . . . Here, Drmic has just attempted to play the ball through for himself, but Risse has surged forward to challenge it and blast a first-touch toward goal for the game-winner that would become legendary. It was a damned fine idea, it turns out. Risse’s shot ultimately missed, though by only slightly more than his near-miss free kick had earlier. Leno was at least alarmed enough to retreat and make a stab at it with his arm, the back of which struck the post pretty firmly as he tumbled backward into his goal. Leno is either laughing at the cheekiness of the shot or wincing in pain. 86: If I didn’t know how this ended, this scene off a corner (as well as the one that won the corner) would have had me coming out of my seat, even at 8:10 a.m.
Vogt has a shot at a game-winner. Again, it was Toprak who turned away the chance, though mostly because Vogt hit him right in the chest with his shot. There is something to be said for positioning, of course. He’s been good at it all match, so credit where due. 88: With the Pill Pimps on the ropes and genuinely doing little more than trying to keep the ball out of their defensive third, it seems a completely fair time to say . . . So könnte ich nicht Fußball spielen . . . Dann wäre ich kein Trainer. This has been lopsided a while, but with the score levelled, it’s been tilted even further. I now realize why everyone was so excited about the finish. There were a few exciting moments on either side of Vogt’s chance. Then Bellarabi milked a tackle for almost half the three minutes extra time, figuring that either Canhaloglu would convert the game winner and time would expire or he wouldn’t and they could still get a point without any more threats. Either way, it was a bit of a dull way to end the match considering the explosiveness of the final quarter-hour. I’m glad to have watched it, even knowing the final result. Be the first to comment on "Re-Live Blog: The Derby that is Not a Derby . . . because I missed it Saturday"